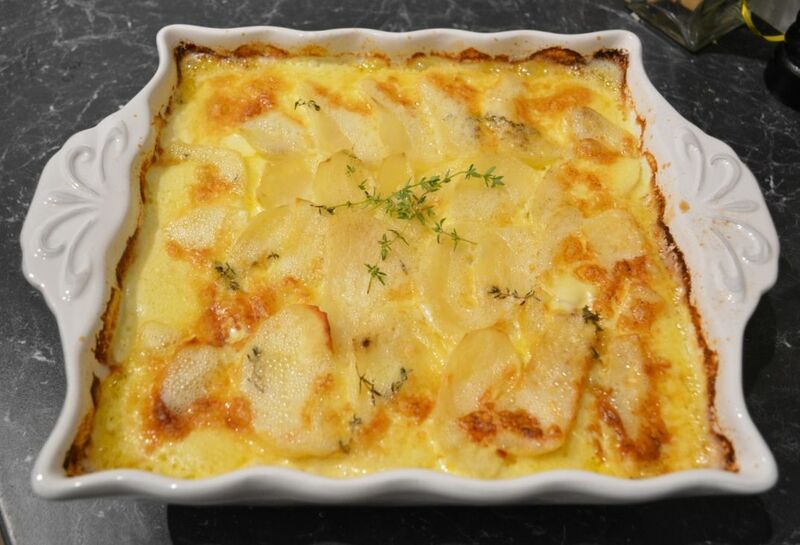 In my house creamy potatoes are always welcomed and loved. The simplicity of this dish is what makes it even more special for me. 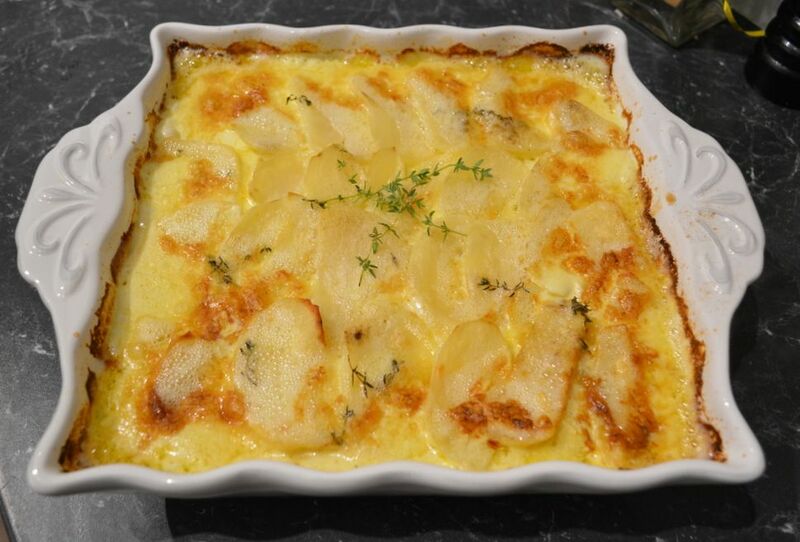 This is a great dish to serve at parties, it is a real crowd pleasing dish, serves large quantities and really, who can resist a potato bake. This is my families favourite potato bake and honestly I will not try another version as this is firstly simple, and secondly, tasty. I have listed pouring cream in the ingredients list, however, you can just as easily use thickened cream if you have it, as I found no difference really, both creams work well. I have even added some chicken stock when I just didn't have enough cream in the house (and I didn't want to go to the store to buy some more), it worked, and was slightly lower in fat. I have stated 1kg potatoes, you can easily increase it to 1.5kg and the creaminess will still be there, without adding more cream, but you can if you want. I like it with 1 clove garlic, but you can increase it to 2 cloves if you love garlic. Potatoes are best sliced with a mandolin, but quite often I slice them with a knife, as I couldn't be bothered pulling out the mandolin, and it is fine. My most important tip, make sure the potato is cooked through before serving, as serving undercooked potatoes will ruin this dish. I check by poking it with a fork or skewer. So give this a try, it will not disappoint. Preheat the oven to 180C/160C fan forced. Grease a 1.5 litre capacity baking dish with the butter. Slice the potatoes to about 3mm in thickness using a mandolin or a very sharp knife. Combine the cream, garlic, thyme, salt and pepper in a very large bowl. Toss the potatoes through until they are well coated with the cream mixture. 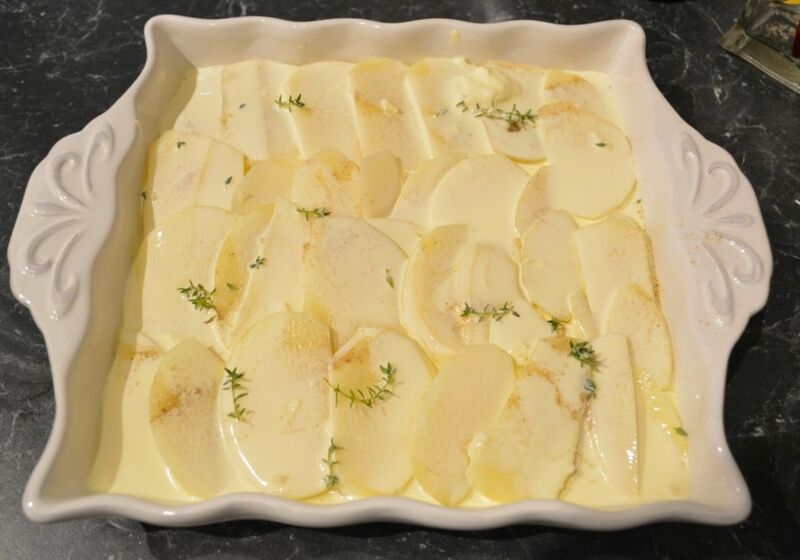 Transfer the potato and cream mixture to the baking dish, spreading it out into an even layer, try and arrange the top layer neatly, press it down a little. Lay a sheet of baking paper on top of the potatoes, then cover the dish with aluminium foil, (the baking paper stops the foil from sticking to the potatoes). Bake for 1 1/2 hours, or until the potato is tender. Remove the foil and bake a further 20-30 minutes or until the top of the potato is golden brown. Allow to sit for 10 minutes, then serve while still hot.